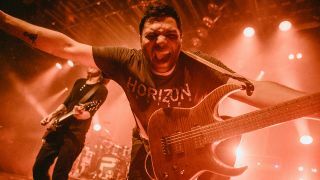 Periphery’s Misha Mansoor and YouTube sensation Justin Sandercoe will give free lessons at the UK Guitar Show later this year. It was previously revealed that Mansoor would perform on the main stage on the 29th, while Sandercoe would lead the acoustic workshops. Now we can announce further details about the pair’s appearances at the celebration of all things guitar. Mansoor will hold a clinic on Band Business advice at 4.30pm on the 30th. He’ll take part in a performance Q&A, and answer questions on working in the music industry and how to make a successful business out of your band. Sandercoe, meanwhile, will take a session on Expanding Your Blues Vocabulary on 30th at 4pm, and take you through ways of expanding your blues-playing knowledge and explore the creativity and nature of the genre. Other sessions include 3 Steps To Playing Fluid Fingerstyle Guitar Without Getting Overwhelmed with Learn Guitar In London's Drue James, and a play along session, focusing on tones and phrasing concepts that will make your riffs heavier with Total Guitar's Jamie Hunt.